Catalina Island was once again the destination for the Orange Spirit Nation. 200+ dads and daughters embarked from Long Beach, CA for the boat ride over to the most popular of the Channel Islands. A weekend at Camp Fox’s beautiful property offered us cabin camping (some with walls and many without!) and lots to do, accompanied by plenty of sunshine. 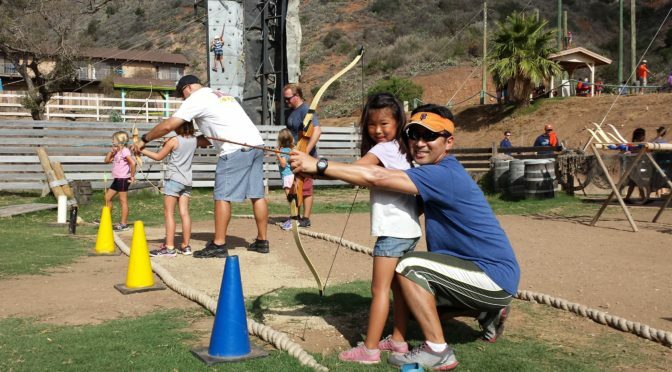 Activities that kept us all VERY busy included archery, hiking, swimming, sea kayaking, fishing, snorkeling, giant swing, rock climbing, and more. Plus, the staff of the Catalina Island Marine Institute (CIMI) showed us local aquatic wildlife and the camp stuff cooked up some great food, too. Beautiful views, great weather, and a Saturday night campfire celebration that featured songs, games, and Indian traditions helped ensure everyone had a great time! After all that everyone was pretty tired so the long boat trip back to the mainland featured many napping princesses (and dads, too).